The four new models being added to the Cameron & Crown line. Last fall, Scotty Cameron unveiled four putters with 33" shafts for players whose setup dictates a shorter-than-standard length. The series consisted of models from the Select and Futura families—Newport 2 blade, Newport Mallet 2, GoLo 5 and the Futura X5R. Based on their success, the company is doubling the Cameron & Crown lineup to include the Select Newport blade with a 303-stainless steel face inlay, Select Mallet 1 with a wraparound aluminum face-sole inlay, Futura 5MB mid mallet, and the Futura 6M, which was the top "large mallet" in GOLF magazine's ClubTest 2017. "I've always said that the length sets the eyes, and the eyes set the path," says Scotty Cameron. "For those men, women and juniors who need a shorter putter, it gets their eyes in the right position to make a proper stroke while maintaining good posture and balance." 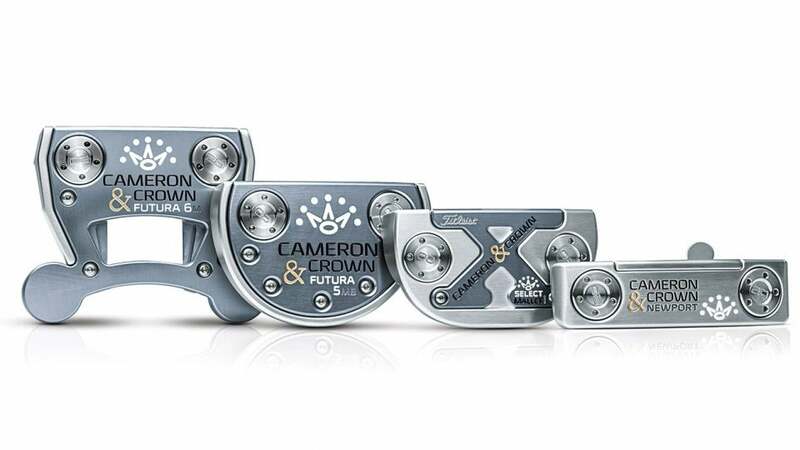 As before, the new Cameron & Crown putters come with a 360-gram head, which includes two 20-gram sole weights for "proper shaft flex and feel." (By comparison, the 34" models have a 350-gram head while the 35" versions weigh 340 grams.) A smaller Matador grip—one-inch shorter than standard and 10 percent thinner—combines with the heavier head and 33" shaft to provide loads of feedback and proper balance. And, the "silver mist" finish provides a non-glare, high-end look. $379; in stores June 16.